Paola is using Smore newsletters to spread the word online. Eww what is that on my hamburger? You're about to take a bite of that delicious hamburger. Wait look at it closely have you ever thought where that meat came from? Is it even sanitary? Think again it may look like heaven when you're starving and have nothing else to eat, but where did that meat come from? Rats have been on that meat if you didn't know. Rat dung has been on that meat. Do you still want that hamburger?
" They used everything about the hog except the squeal." -The Jungle, The Jungle Ch.3. 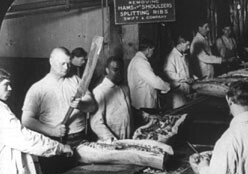 The meat packers use the whole pig to process as meat. It doesn't matter if it’s the eyes, the ears, everything is used. “ And for this, at the end of the week, he will carry home three- dollars to his family, being his pay at the rate of five cents per hour” - The Jungle, The Jungle, Ch. 6. Even though the workers in the meatpacking industry work very hard they get paid very little. And it is all because they are trying to maintain their family. " This is no fairy story and no joke; the meat will be shoveled into carts and the man who did the shoveling will not trouble to lift out a rat even when he saw one " - The Jungle, The Jungle, Ch.14. There is rats everywhere even though the workers could see them they do not remove them. They leave the rats in the meat and leave the rat dung as well. How many germs are in the rat, that went to the meat. Yet the people outside the factory eating the meat have no idea what they are eating. "It is an elemental odor, raw and crude; it is rich, almost rancid, sensual and strong " - The Jungle, The Jungle, Ch. 2. Because of the rats and the meat the smell is horrible and it smells very disgusting and it is disturbing. It is a surprise that the people outside the factory cannot smell the scent. The meat is also being stored and there is a lot of dust that gets in the meat. And a man can run his hand on the meat and he can feel dried dung of rats. But that doesn't matter one least because when I walked in the factory everyone was at work. The workers aren't bothered a single bit of all the unsanitary things. Cross contamination is occurring at every moment. They use the same knife to cut pig, cow and other meat. I look at the owner and he doesn't care on single bit. 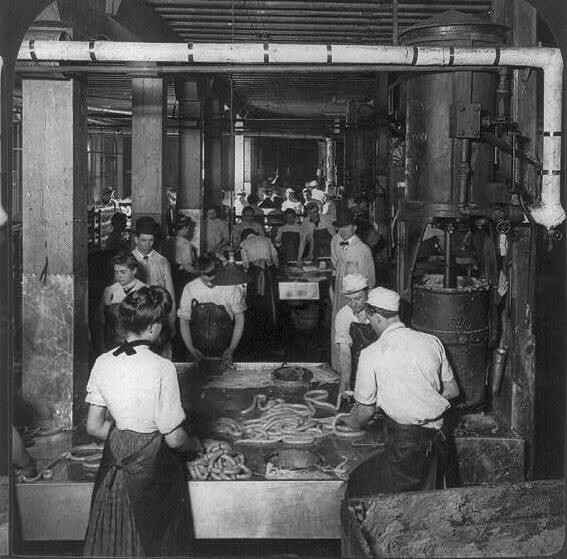 Thankfully in 1906 The Meat Inspection Act was enforced that made everything in the in the factories healthy and sanitary. In 1906 The Pure Food and Drug Act was passed. This made the factories put all the ingredients of the product on it . These facts and many others were found in the book The Jungle by Upton Sinclair. 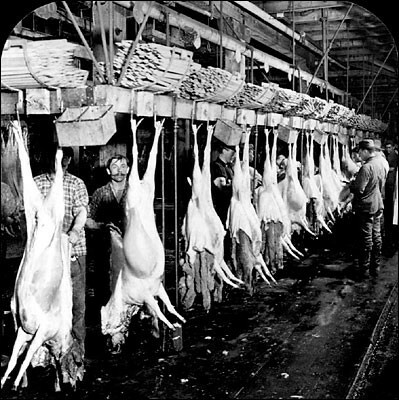 It showed the reality of how the meat packing industries ran. Not everything was perfect was the people found out. And thanks to the muckrakers they found out the truth. Muckrakers were reporters who showed the reality by expressing in the newspapers pictures and other things. Now you decide whether you still want to bite into that hamburger. Do any of the problems that existed in the Progressive Era still exist today? If you were a muckrakers today, what you choose to write about? Why?